Snow Tubing has closed for the season. Thank you for making memories with us this year and we look forward to seeing you again for the start of the 19-20 winter! Tubes, thrills and screams are provided at no extra charge! 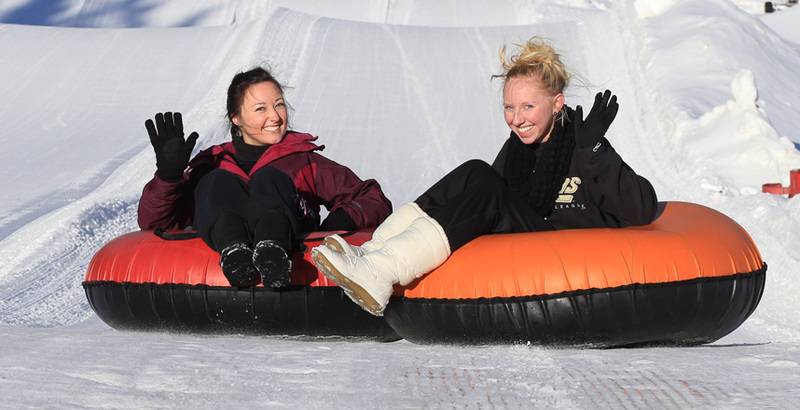 - The tubing park is open to children ages 10 and older without adult supervision. - Children ages 4 - 9 must be accompanied by an adult. - Children must be at least 4 years-old to tube. - Each person must ride in their own tube. - Space is limited, so arrive early. - No advance reservations can be taken over the phone. A limited number of ticket vouchers are available for each session online. - Ski boots are not permitted. - Hours are subject to change. Please check the Snow Report for more information. - The final day for Snow Tubing at Hidden Valley will be Sunday, March 10, 2019, weather permitting. - We offer a group rate of $3 off any session on Fridays, Saturdays, Sundays and Holiday, with a minimum of 15 people. - Reservations for groups of 15 people or more may be made on Thursdays at the regular rate. - Group rates are not valid for Tube-A-Palooza. - Group reservations must have a guaranteed count and full payment 48 hours in advance of their scheduled date. - Available only during hours the tubing area is not open to the public for a minimum of 50 people. - Please call 814-443-8000, ext. 300 for available times and rates. - Reservations are required with minimum count and full payment due 48-hours in advance. The Hidden Valley Snow Tubing Park is located past the main entrance to Hidden Valley Resort, on the right, if coming from Donegal on Route 31. Coming from Somerset, the Snow Tubing Park will be on your left as you go past Kooser State Park.